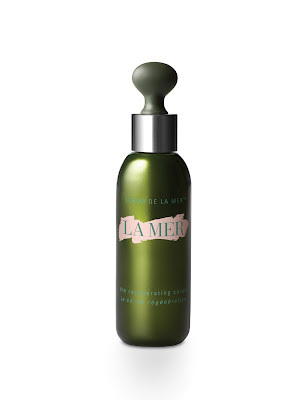 Check out some of my other La Mer reviews HERE and HERE. Also check out my youtube tutorial/review by clicking HERE! A treatment that is light years ahead of its time. Designed for daily use, this high-powered treatment utilizes a unique sunscreen blend to provide broad spectrum UVA/UVB protection while keeping skin soft, comfortable and hydrated. An array of light-transformation benefits uniquely empowers the skin. Tourmaline and malachite gemstones absorb light energy, transforming it into beneficial green light to enhance anti-oxidant activity. The appearance of discoloration is prevented. Exclusive photonic spheres capture light while diverting potentially damaging light from the skin. Exclusive to La Mer, they light up the skin, promoting a healthy, luminous appearance. The SPF 30 UV Protecting Fluid utilizes smart seaweeds to keep skin comfortable, hydrated and soothed. These natural humectants attract moisture to the skin and create a protective, emollient barrier, helping to prevent dehydration. Luxurious and lightweight to the touch, this transparent fluid formula is an ideal makeup primer. Worn over Crème de la Mer, The SPF 30 works as a generator, boosting its efficacy. After moisturizing, shake bottle and apply a small amount onto fingertips and smooth all over face and neck. For the ultimate results, use in the daytime over Crème de la Mer to help makeup stay smooth and flawless. I really like the UV Protecting Fluid! I think it's perfect for hotter weather because it's so lightweight, offers amazing UV protection, and once it's applied it sinks into the skin and doesn't budge. Plus, it makes an amazing makeup base/primer... OR you can mix a little into your foundation to sheer it down! This silken, lightweight fluid has the power to transform the complexion. Engineered with weightless color and La Mer’s remarkable skincare benefits, this silken, lightweight fluid has the power to transform the complexion. Gemstones capture light energy to create a translucent color palette, optically erasing imperfections to reveal a naturally flawless complexion. Created with a rare blue algae transformed through La Mer's exclusive bio-fermentation process, a Blue Algae Lift Ferment along with precious marine and plant actives immediately add radiance while working continuously to lift the skin, restoring a lasting firmness, clarity and brightness. Skin’s ability to renew itself is greatly enhanced as it is trained to sustain a smoother, softer, more resilient appearance. Flexible medium coverage brings skin a naturally luminous finish. Protects with SPF15. Shake Well. Pump onto fingertips. Lightly pat and smooth over skin. For the ultimate results, use in tandem with Crème de la Mer. This shade is a little on the yellow side for my complexion (maybe a little too dark as well). But let me just confirm that I absolutely LOVE this foundation!! The coverage is exactly what I am looking for in a foundation; medium to full! It has a satin finish and leaves your skin looking glowy, almost ethereal. This luxurious, lightweight powder is infused with gemstones that capture light to reveal a naturally flawless complexion. This luxurious, lightweight powder foundation may be applied to create uniquely flexible coverage. Gemstones capture light energy to create a translucent color palette, optically erasing imperfections to reveal a naturally flawless complexion. An exclusive Radiant Ferment works continuously to add visible clarity and brightness, revealing a more luminous appearance. This versatile powder foundation is ideal for natural, long-lasting coverage and simple touch-ups over any other Skincolor foundation. Apply with sponge for buildable, medium to full coverage. For lighter coverage, apply with puff. Ahhh, the heavenly silkiness of this powder is unlike any other I have tried! It is a really great coverage! You could get a medium coverage if you applied this over a tinted moisturizer! On those days that you wake up and don't feel like getting all dolled-up, grab a concealer and this powder and you are good to go (no need to apply liquid foundation). Now if you want extra/full coverage you can use the La Mer Treatment Fluid Foundation AND this powder! I received a couple of samples of this serum, unfortunately I haven't used enough to tell a complete difference in my skin. One thing I like is that it isn't too sticky like some other serums I have tried in the past. My mom swears by La Mer's Lifting Serum; she said she felt her skin tighten and tone!! Crazy. I think I'll go ahead and give her my extra sample of this serum and see what her thoughts are on this one compared to the Lifting Serum. Crème de la Mer was conceived under extraordinary circumstances. Years ago, aerospace physicist Dr. Max Huber set out to create a cream to help heal the appearance of the scars he had suffered as a result of severe burns from a lab accident. decided to help himself. Intrigued by the regenerative properties of sea kelp and the physical energies of light and sound, he began his research into bio-fermentation. After his journey spanning 12 years and 6,000 experiments, he came to perfect the highly potent Miracle Broth™ and the legendary Crème de la Mer. Just as Dr. Huber envisioned, Crème de la Mer helped empower skin’s natural healing energies, miraculously transforming skin’s appearance. To this day, the miraculous powers of The Miracle Broth™ —Dr. Huber’s potent elixir known for its healing energies—remain at the heart of Crème de la Mer and are at the core of La Mer’s latest innovation in skin care: The Regenerating Serum. Current scientific studies suggest that lines and wrinkles are “micro-scars” to skin’s underlying support network. Their formation is thought to be triggered by chronic inflammation caused by a variety of internal and external stressors such as UV sunlight and free radicals. These inflammatory stressors can lead to the destruction of collagen, which in turn provokes premature skin aging. Inspired by these findings, The Max Huber Research Labs have created The Regenerating Serum, La Mer’s new anti-aging powerhouse. Four years and hundreds of hours of lab work in the making, this ultra-luxe elixir is the result of the combined effort of physicists, marine botanists and biologists around the world. Not only does it contain a high concentration of La Mer’s proprietary Miracle Broth™, but it also includes the new Regenerating Ferment™, derived from marine plant stem cells. Selected for its vigor and ability to withstand and resist stress, the stem cells of a marine plant Eryngium Maritimum are harvested and grown in a lab through sustainable processes. The cultivated cells and the liquid that contains them are then fermented, using sono-chemistry that helps to boost the activity of the ingredients to create The Regenerating Ferment™. It’s a process similar to that which Dr. Max Huber pioneered when he created its predecessor, the Miracle Broth™ in Crème de la Mer. Miracle Broth™: The original fermented elixir, known for its healing energies, developed by Dr. Max Huber. The Regenerating Ferment™: A new bio-ferment containing potent marine plant stem cells. The Regenerating Ferment™ assists in the skin’s renewal, helping support its natural structure, restore its integrity and protect it from external aggressors. The Marine Peptide Ferment: An anti-age marine algae and peptide complex which helps firm the look of skin and boost its natural collagen production, reducing the appearance of lines and wrinkles. Colloidal Gold: A skincare super-conductor that effectively delivers skin smoothing, firming and anti-irritant benefits to the skin. Usage: After cleansing and toning, tap several drops onto fingertips and sweep over face and neck each morning and evening. The Regenerating Serum 1 oz. What is inflammation and how does it age the skin? Inflammation is caused by anything from over-exposure to ultraviolet light to environmental aggressors to the ingestion of unhealthy foods, and is basically a stress reaction in the body. Inflammation triggers immune cells, which can damage healthy collagen and elastin. Once collagen and elastin are compromised, skin can develop “micro-scars,” or tiny wounds beneath the skin. Long term inflammation can lead to deeper wrinkles, stubborn age spots, skin redness and sagging. A man ahead of his time, Dr. Max Huber somehow intuitively understood the importance of combating these resulting signs of aging years ago when he developed his highly potent Miracle Broth™. He created the broth by combining sea kelp with ingredients such as calcium, magnesium, potassium, iron, lecithin, Vitamins C, E and B12 and oils of citrus, eucalyptus, wheat germ, alfalfa and sunflower. These ingredients then journeyed through a 3 to 4 month bio-fermentation process that incorporated light and sound. As Dr. Huber envisioned, the resulting Miracle Broth™ had powerful soothing anti-irritant properties, helping skin look younger. What exactly is a Marine Plant Stem Cell? any part of the plant–a stem, a leaf or a petal. the plant stem cells in a sustainable way without killing the plant. Once the cells are harvested, we nurture them in the lab to grow them in a larger scale before they go through La Mer’s transformative bio-fermentation process. continued use of The Regenerating Serum? Serum starts to work on contact. You actually feel it. You put it on and you feel something is transformed. It’s absolutely ephemeral, so lightweight, it imparts an immediate dewiness. Then four to eight weeks out, something has really changed: Tone and texture are markedly improved; skin looks firmer, stronger and healthier. It works beautifully in combination with Crème de la Mer, The Moisturizing Lotion, The Moisturizing Gel Cream and The Oil Absorbing Lotion. We say that you see the difference in a day, but with continued use it’s really remarkable. natural ability to renew its appearance. inscribed across the original jar of Crème de la Mer. Ooh the high end stuff!! !